Carpet tile, also referred to as modular tile or carpet squares, has traditionally been a solution for commercial flooring. Thanks to their easy installation, you’ll now find carpet tile in most commercial settings as well as residential households. Carpet tiles come in many shapes, sizes, colors and fiber types. Often, carpet tiles will have an equivalent broadloom product, making it easier to find matching versions of the right sizes or pieces to do any job, even for unusual layouts. A big difference between broadloom carpet and carpet tile is the backing. Backing options include vinyl, fiberglass, vinyl/fiberglass, urethane, woven polypropylene, and recycled vinyl. A high-quality backing is critical, as it provides dimensional stability and withstands moisture. In addition to backing options, different installation systems are also available, including full spread installations with pressure-sensitive adhesive. Some offer a peel-and-stick approach while others use TacTiles. TacTiles connectors are faster, cleaner, and more ecological than traditional carpet adhesives. Carpet tiles can be installed in office buildings, computer rooms, basements, three-season rooms, corridors, hallways, landings – just about anywhere within a commercial setting or residential home. Carpet tiles can also be installed over existing floor coverings, making the installations easier. Another major benefit of carpet tiles are the ease of swapping them in and out of a job setting if any tiles sustain damage or staining. Sizes include (but are not limited to) 18” x 18”, 24” x 24”, 12” x 36”, and 24” x 36”. While these sizes may seem confusing at first glance, each is best suited to a particular application. 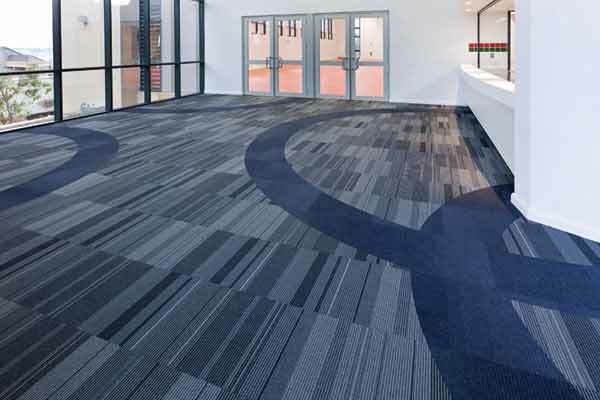 Different sizes enable different design layouts to be implemented for your flooring project. To find the right size tile for your job, it’s important to understand the characteristics of each size. There are also different options for laying carpet tile: Monolithic, Quarter Turn, Quarter Drop, Brick, Herringbone, Ashlar, Random and Parquet. Carpet tile offers fantastic design choices, often specified by designers with the top architects in the business. Carpet tile is convenient for the installer and allows for the carpet to be installed in sections, as opposed to the entire room as it would be with broadloom carpet. At Keystone Floor Products, we’ll help you understand the size and laying options that best fit your application. Contact us today to learn more.